Outgoing Deputy Editor Kirstie Sutherland reports on the flash flooding that hit Selly Oak at the end of May. On Sunday 27th May, the UK experienced adverse weather conditions, with the West Midlands being one of the worst affected regions by heavy storms. In particular, the areas surrounding UoB were severely hit by heavy rain and flash flooding, with Edgbaston recording 60mm of rain - more than a month’s worth - in an hour according to the Environment Agency. The ‘Fab N Fresh’ Facebook page was quickly awash with posts documenting the heavy rainfall, ranging from students ‘swimming’ along Dawlish Road to violently overflowing drains outside Yakinori and Sainsbury’s on Bristol Road. Tiverton Road was one of the worst affected, with the dip outside Tiverton Pool causing several cars to become stuck and submerged in several inches of rainwater and unable to be moved. Eventually, flood waters rose to such a level that the Bournbrook-Bristol Road junction, opposite the university’s South Gate, was closed, resulting in long traffic queues. 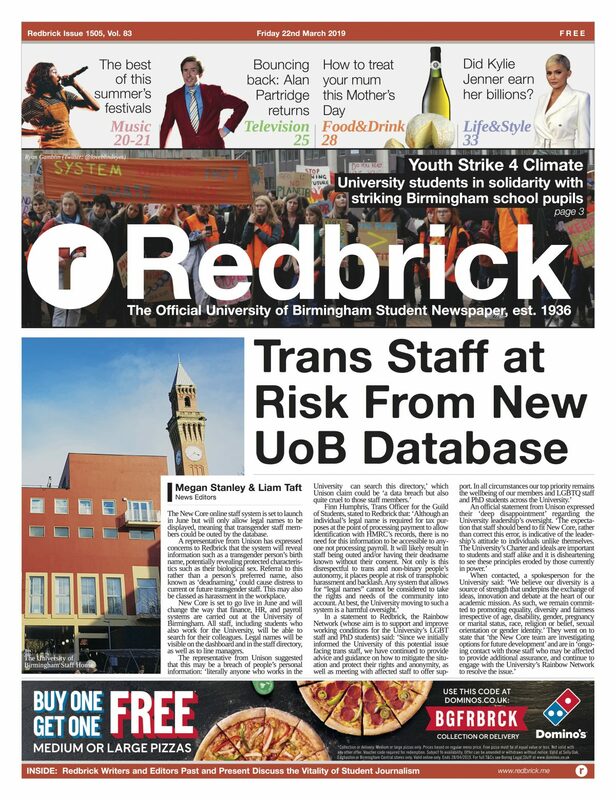 With the majority of the student body living in and around Selly Oak, most were affected by rising water. Several ground floor rooms were completely flooded, leaving carpets waterlogged and furniture damaged and rotting from the sheer amount of water. Many students were subsequently forced to seek alternative sleeping arrangements once the weather had subsided. Several parts of UoB campus were closed due to the storms. The ground floors of both the Physics West and Mechanical and Civil Engineering buildings were completely flooded, with the Sports Centre being closed by early evening due to ceiling leaks. The top floor of the Main Library was also closed due to leaks, before eventually being evacuated and closed until the following day. The Guild basement, home to several spaces housing important technical equipment such as the Redbrick office and BURN FM studios, was flooded and resulted in a further closure of the entire building by 8 pm. The devastation occurring ahead of the last week of the university exam season, and on the eve of a bank holiday, caused major concerns for much of the student body. However, the university issued a statement that exams planned for Tuesday 29th May would go ahead as planned, although the estates team were assessing affected buildings and study spaces to determine changes in location for some. Across the rest of the West Midlands, flooding was also rife, with hundreds of homes devastated by the weather and stretches of the M5 completely submerged. The fire service received more than 1,000 calls within hours of the torrential rain, with police called to Rushall in Walsall to attend to a minibus that had been completely submerged - an elderly man stuck inside the vehicle was later pronounced dead at the scene. Within 24 hours of the storms, the floods had virtually disappeared, with most of campus including the New Library and Sports Centre being reopened as normal by 10 am. However, it remains unknown the extent to which the houses of Selly Oak and its surrounding areas were truly affected.